(I know this photo has romaine lettuce in it, which you can totally use, but I prefer using a cabbage/slaw mix, listed in the ingredients below). So buffalo chicken wraps are one of those things that I love. I love the heat from the sauce, the creamy blue cheese, the cheddar cheese mixed in… But man, they can be so high calorie between the blue cheese dressing and the cheddar cheese. 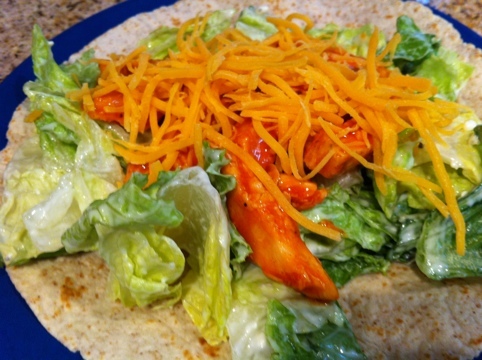 I really didn’t want to give up my buffalo chicken and came up with a really quick, easy, delicious, filling and low-calorie wrap that you can have for dinner or lunch and be pretty pumped that it came under 300 calories. 1. Mix the chicken and buffalo sauce together in a bowl, or a bag if you choose. I use a bowl to do this, then put it on the tortilla once it’s nice and coated! 2. Put the cole slaw in the bowl, and put the 2 tbsp of bleu cheese dressing in with it. Mix this up real good, getting the bleu cheese all mixed with the slaw, then put it on top of the chicken. 3. Put your shredded cheese on top. Fold it up and EAT. I told you it was quick and easy. This is one of my absolutely favorite go-to meals when I want something low-cal and tasty and filling. Between the tortilla, the chicken, and the cabbage, you will be totally full after eating this and happy it was under 300 cals. Matt is also a huge fan, so it’s a great easy recipe to have between the both of us. Lemme just start in saying that I heart fish tacos. I love the fresh taste, the seasoning, the crunch of the cabbage/slaw… Fish tacos hold a dear place in my heart. However, most fish tacos at restaurants are not so good for you. We bought some Mahi Mahi from Costco and I knew I had to try to find a way to make delicious fish tacos that weren’t going to be super high calorie. Okay guys and gals, this recipe? This recipe is seriously so good I have have HAVE to share it with you. Mainly because it tastes WONDERFUL, they take like no time to make, and also because you can technically have a fish taco for 200 calories. And a big one at that! Now me personally, I like to add a few little extras, so it pushed mine up to 260-280 but um, hello, 270 calories for a totally bombdotcom fish taco? Yeah, sign me up. Matt was a huge fan of these, and I’m pretty sure I will be making these at least once a week, if not more, because of how easy and quick it is to make them. 1. 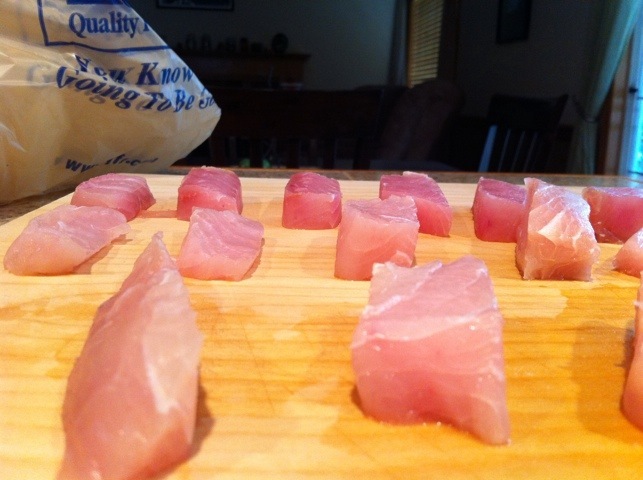 Making sure your Mahi Mahi or other fish is thawed, cut the fish up into 1/2 inch strips. Not too thin but not too thick so when you cook them in the pan they don’t get overcooked. 2. 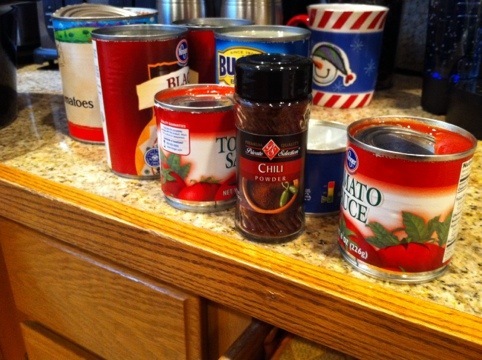 Take your fish taco seasoning (this part may SUPER vary depending on what the package says, but for this is specifically for the fish taco seasoning I bought), mix it with 1/4 cup of water in a bowl, making sure it’s completely mixed well, creating a marinade. 3. Place your strips of fish into a large Ziploc bag, and coat the fish in a little vegetable oil (maybe 1 tbsp.) This will help the marinade stick to the fish. 4. 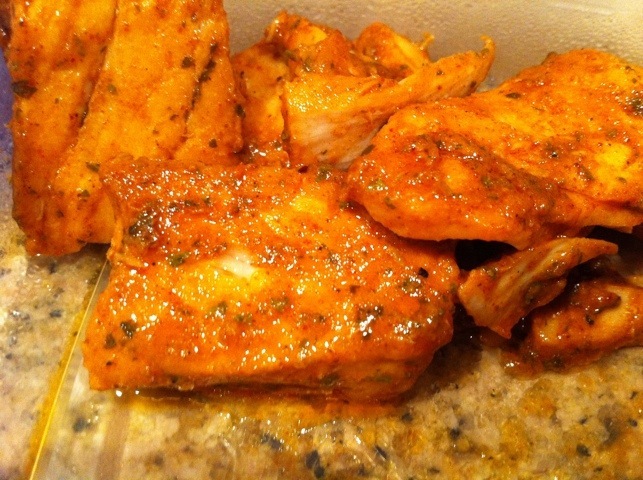 Dump your marinade into the bag with the fish, and shake it around to ensure that all of the marinade gets on every piece of fish. You can let it sit for 5 minutes or if you have all the time in the world, 5 hours. I was in a rush so I let it sit for 5 minutes while I waited for the pan to heat up. 5. Speaking of which, pre-heat your stove to medium to medium-high, and put a nonstick skillet/pan on. I’d suggest putting a little nonstick spray on for extra measure, because the marinade will definitely stick a bit to the pan. 6. Put your fish in the pan and cook it for around 3 minutes per side. You’ll know your fish is done when it’s flaky, white on the inside (pink is bad! ), and firm. Some of the smaller pieces started to kind of flake a little when I moved them around, so I had an idea they were done. Oh and I used tongs to flip the fish, as I found it much easier than using something like a spatula since you’re dealing with a bunch of strips of fish. 7. Once done, place the fish on a serving plate. It should smell absolutely divine and you may want to even try to just eat the fish on its own. But don’t, because once you put them on your tortilla with everything else, you’ll be quite happy you waited. 8. I personally heated up my tortilla in the micro for 15 seconds, because I like warm tortillas (though Matt likes his cold, so either way is fine). 9. Put on your toppings! I personally put on the sour cream first, then the fish, a squeeze of lime juice, then the avocado mix, the slaw, lots of cilantro, and topped it off with pico de gallo. This made a ginormous taco, so I knew I’d be having the other half of my fish for dinner the following night. 10. EAT UP! I doubt you’ll be disappointed. If you’re like me and like a little extra fun toppings, you’ll be looking at around 270 calories, as we’re adding in 30 cals of sour cream and 50 calories of avocado. 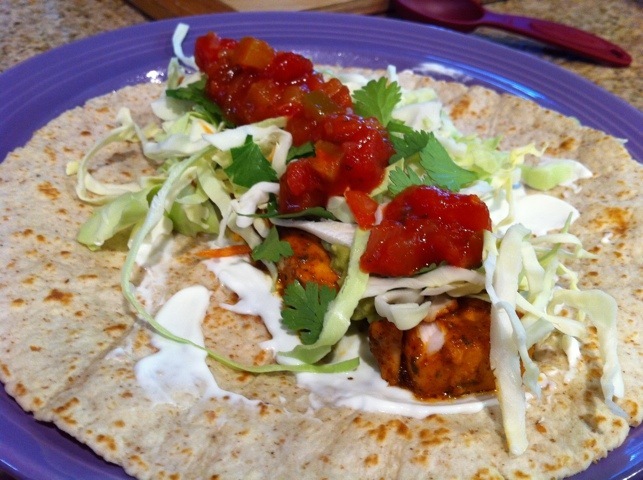 Between the amazingly high fiber, high protein tortillas, the high protein fish (4oz. of Mahi Mahi has 21g of protein! ), and the delicious toppings (I pile on the slaw because I LOVE the fresh crunch it gives the taco), you feel totally full and you feel like you got to eat really great food but without all the extra calories attached. This recipe is more my own thing I created on a whim, so feel free to mess around with it. 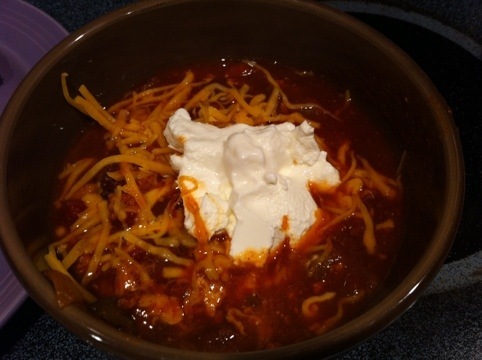 I might add jalapenos next time (I totally forgot to buy them) for an extra kick, but you can really vary this one up. I love tacos because you can put so many toppings on that are zero calories and add great flavor and texture to your meal! This is seriously one of the easiest and quickest desserts you can make. It’s got 3 total ingredients (2 if you decide to leave out the peanut butter), and tastes so good you won’t even realize you’re eating a much lower-calorie version of your favorite cake. 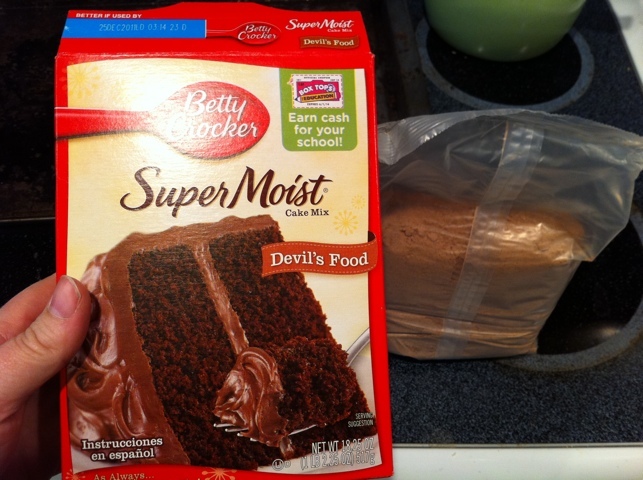 It’s moist and fluffy and absolutely delicious. Matt even REALLY enjoyed it, and he’s pretty picking about his cake/knowing when something that is supposed to be “healthier” honestly just tastes like crap. You can pair this up with a Cool Whip topping (which is really tasty) or just eat it without it! 1. 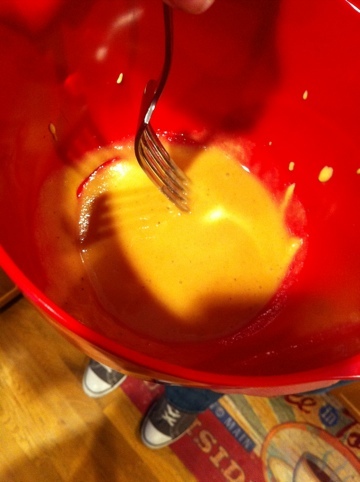 Put the cake mix into a bowl. 2. 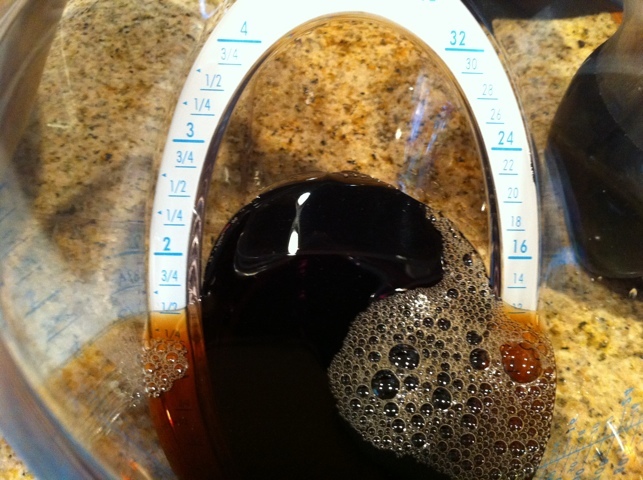 Pour the soda in with the cake. 3. Mix the cake mix and soda until it’s smooth. DO NOT over-mix it though or you will end up with really fluffy cake and it won’t taste very good. 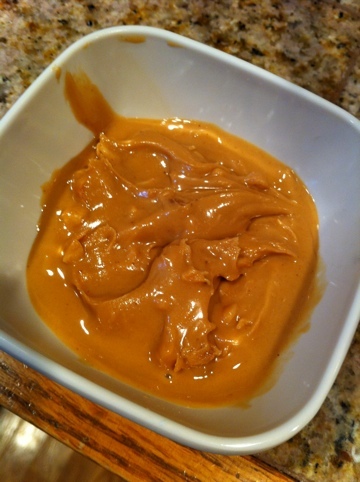 Put the peanut butter in with the mix in the bowl, and mix it in. 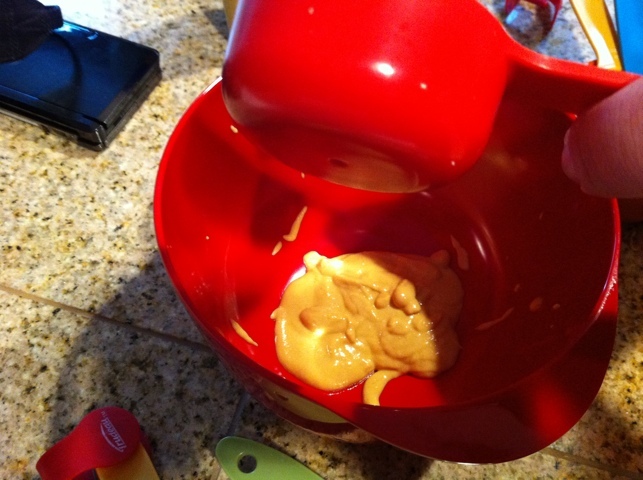 Wait to put the peanut butter on TOP of the cake when it’s in the pans, and then make a peanut butter swirl on top. Personally, I did the peanut butter into the mix but I’m thinking next time I’ll try the swirl on top. 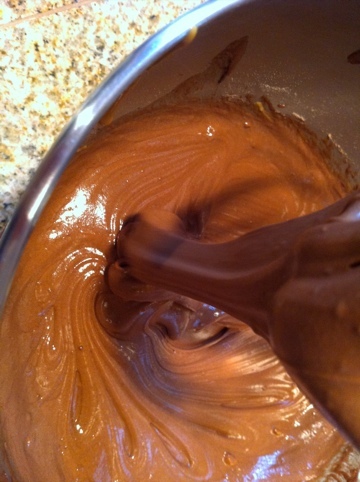 By mixing it in, it gives a chocolate with light peanut butter flavor. 5. Pour the cake into your pans. Oh, I’d suggest using pans vs. cupcake tins. I made soda cupcake before and they fell apart way too easily and became mush. 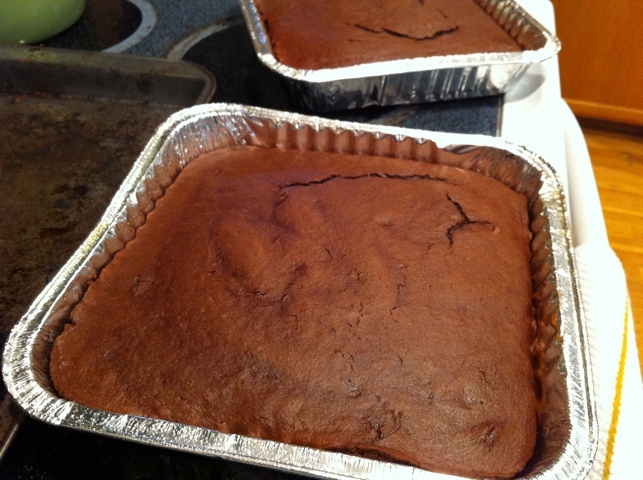 Not sure if it was the mix I had or what, but this time the cake turned out way better when I used two 9×9 cake pans. 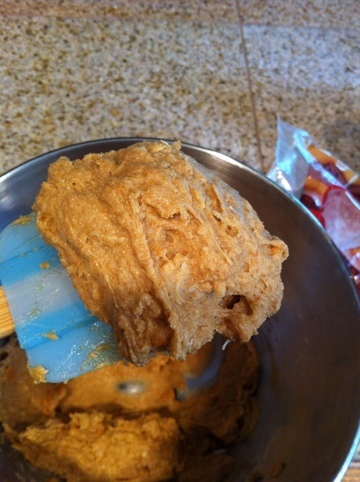 Put the peanut butter on top if you’ve chosen to do that, using a knife to make pretty swirls in your cake. 6. Follow the directions on the box for baking time/temperature. 7. Take your cake out of the oven, let it cool down, and enjoy! 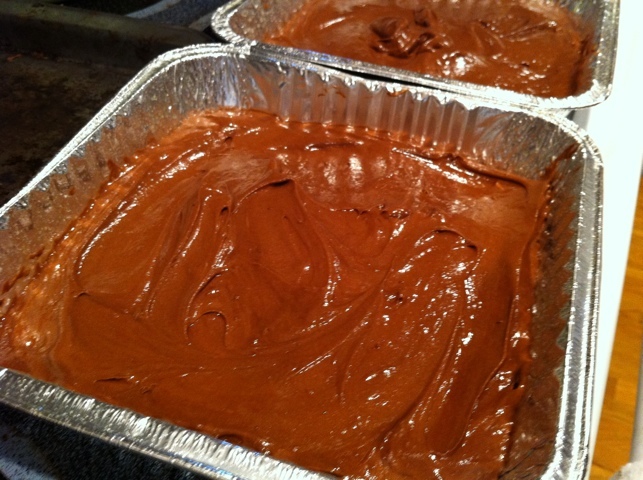 Calorie-wise, it may vary depending on what kind of cake mix you used. You can totally also do this with yellow/confetti cake, just make sure to use diet Sprite or something like that, so it doesn’t turn a gross brown. 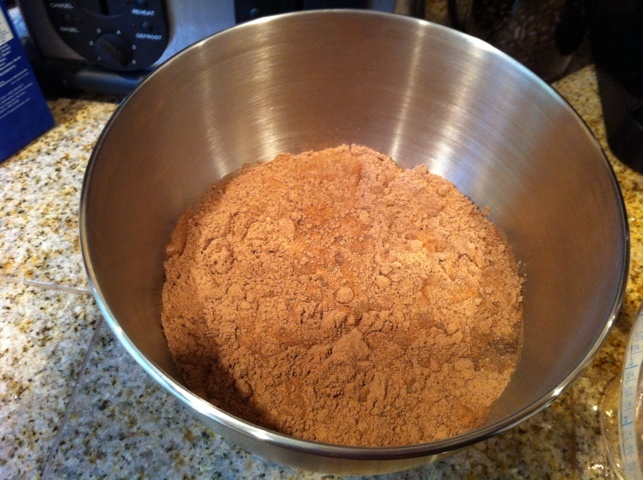 Most cake mixes are 170-180 for 1/12 of the cake. The box I bought was 170 per serving, then an additional 17 cals for the peanut butter, so for one big slice of cake, it’s 187 calories. I’m planning on using this recipe in the future to make a really awesome trifle with yellow cake, light Cool Whip, with blueberries and strawberries. Now that you can eat your cake and not feel guilty, there are endless possibilities of what you can do with cake in the future! Okay, this is a recipe I’m pretty excited about. I was trying to find a good recipe for chocolate chip cookies, and found one here. I was sold at the cookies only having around 61 calories, and not being made with Splenda, so I knew I should give them a shot. After making my usual Sunday morning trip to the neighborhood QFC, I got to the car and realized, “Crap, I totally forgot to get chocolate chips.” I think I got sidetracked by all of the good deals on stuff (I’m a ridiculous bargain shopper). Anyway, I didn’t feel like going back inside because it was pouring out, and remembered I had peanut butter chips and coconut shavings at home. An idea was born. “I wonder if peanut butter chips and coconut would be good together?” So I tried both of them together and man, peanut butter and coconut is quite delightful together. So I basically modified the recipe from that site, and came up with my own version. 1. Preheat the oven to 350. 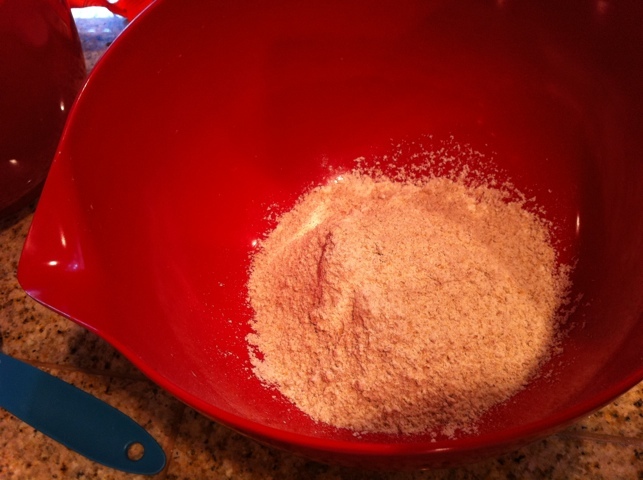 Take the flour, baking soda, and salt and mix those together in one bowl. 2. 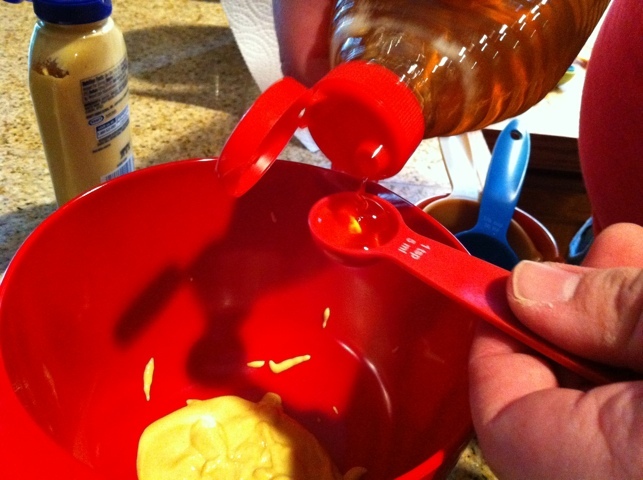 Take the sugar, brown sugar, butter, egg white, and vanilla extract, and whisk those in a separate bowl. 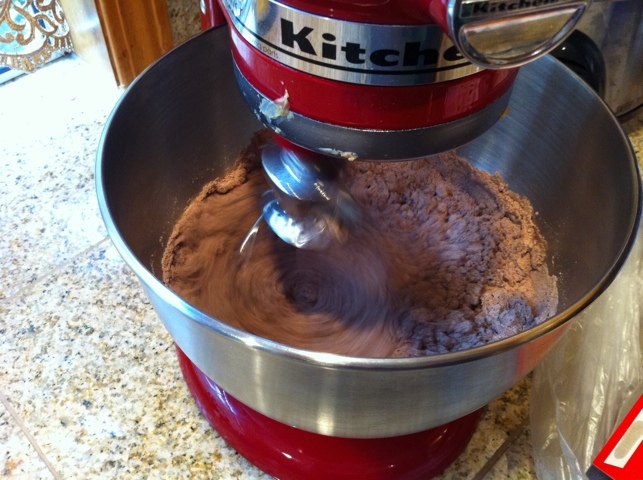 I used our Kitchenaid mixer, and gave it a good whisk until it was creamy. 5. 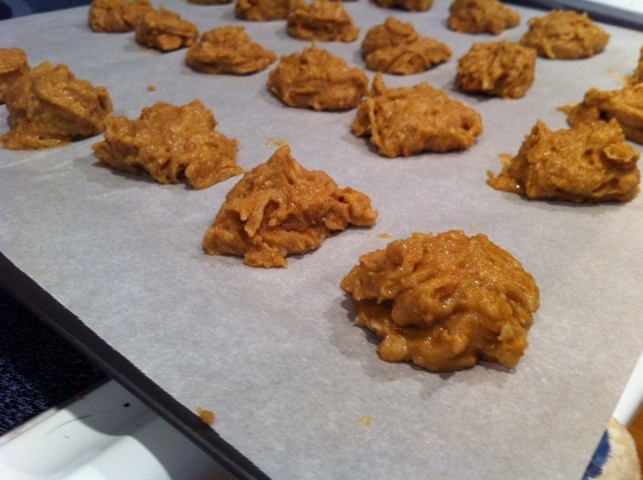 Take little spoonfuls and put them onto your baking sheet. I personally use my cookie sheets, but for extra caution and less clean up, used parchment paper so the cookies wouldn’t stick. Parchment paper is seriously your BFF when baking cookies, no joke. 6. Put them in the oven for around 10-12 minutes. I’m wondering if I tinker with the oven temp, bringing it down to 325, if that will make the cookies less flat. 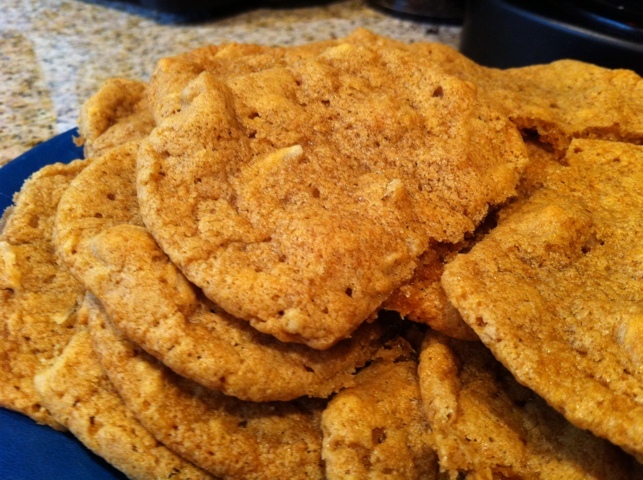 Probably not though, I’m thinking they just need more flour but I’d rather have a flat chewy cookie for 68 calories than a big fluffy one for way more. 7. Let them cool off, then voila, you have some delicious cookies. 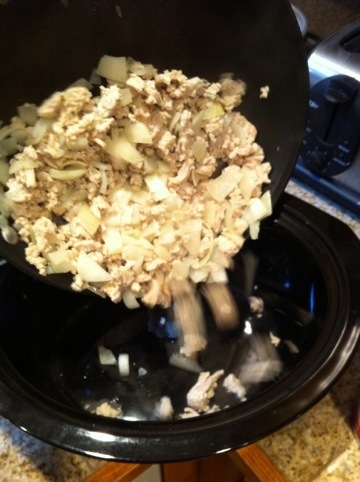 I went and calculated every ingredient I used in this recipe, to ensure I had the proper calories, fat, protein, etc. for each cookie. One cookie is 68 calories, 3g fat, 11.5g carbs, 1g protein. As promised, I’m posting the recipes to what we made for dinner on Saturday night. 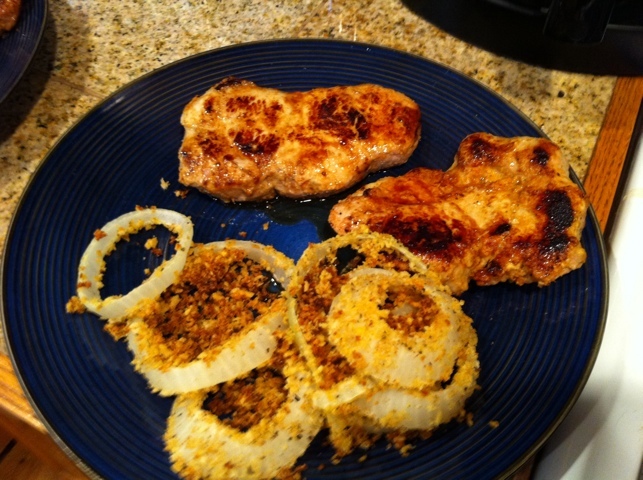 The pork chops were absolutely delicious and will for sure become a favorite for us to make. Easy one to prepare the night before so it’s nice and marinaded when you go to cook the chops. You can use bone-in chops or go for the boneless, which is what we did. I’m also posting the onion ring recipe. It was a slight failure in my first batch I made, as I’d had issues with getting the coating to stick (based on the recipe I’d found online). Kim responded to a tweet I’d made about having problems, asking if I’d coated them in flour first. Between Kim’s response and a recipe I’d come across while trying to figure out where I went wrong, I realized that I should’ve done them different. Second batch came out much better, so I’ll give the recipe I used for the 2nd batch. 1. 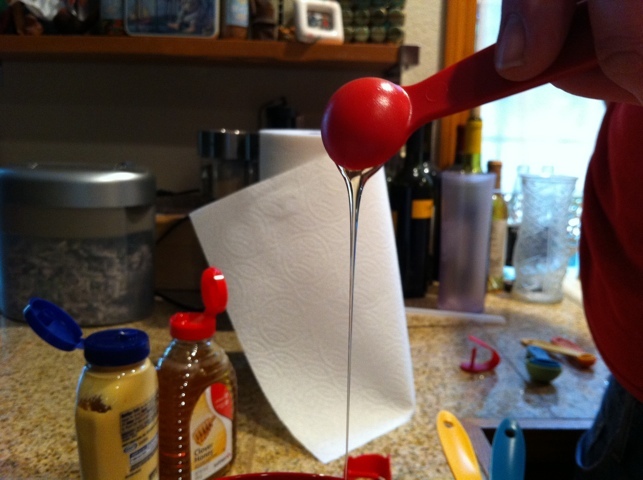 In a small bowl, mix the honey, dijon mustard, vinegar/cider, salt and pepper. 2. 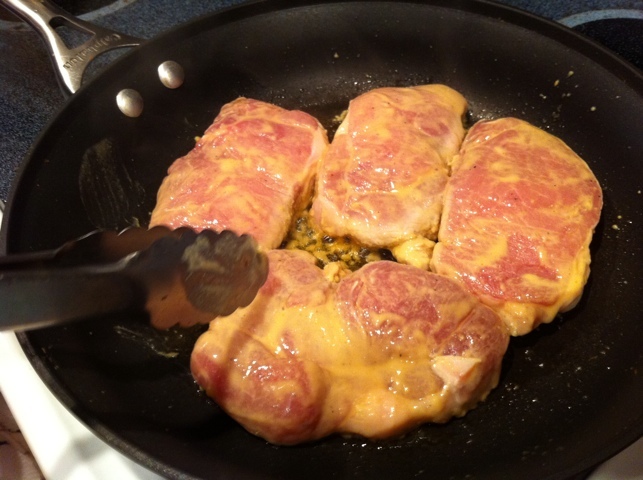 Put the honey-mustard mixture into a large zip-lock bag, then place your pork chops into the bag. 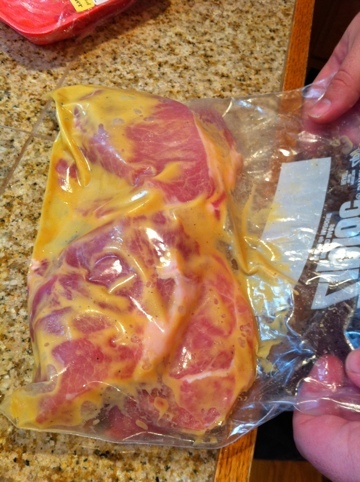 Make sure when you seal the bag you get out as much air as possible, as you want to allow the pork chops to really sit in the marinade. Make sure you turn the bag over and over to ensure that the marinade gets all up on yo’ chops. 4. Okay, chops are ready! So you can do these one of two ways. You can either cook them under a broiler or cook them in a pan. We did them in the pan, as we didn’t want to destroy them under the broil option in our oven. Matt did each side for around 5 minutes, and I was standing there trying my best not to just eat them all. If you do broiler, it’s around 6-7 minutes for each side! 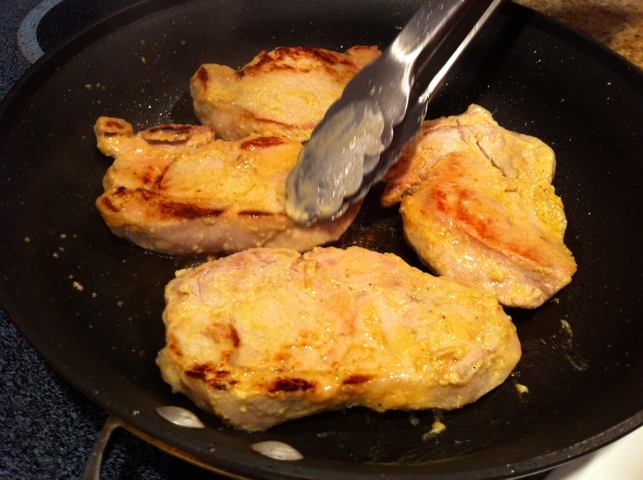 Serving size: 1 pork chop, yields Calories: 178 ; Total Fat: 7g ; Saturated Fat: 3g ; Carbohydrates: 2g ; Protein: 26g ; Calcium: 27mg ; Sodium: 124mg. Totally amazingly delicious and I highly recommend this recipe. 1. Preheat the oven to 400 and spray your baking sheet with nonstick spray. 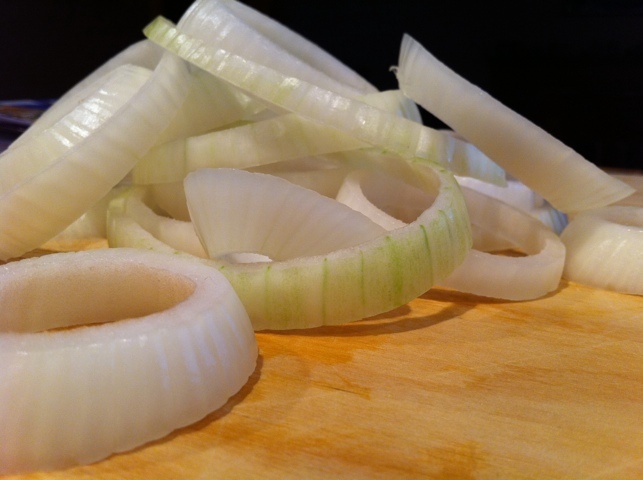 Cut the onion into rings. Make sure you don’t make them too thin or they end up getting all floppy/burnt and aren’t really good for rings. 2. 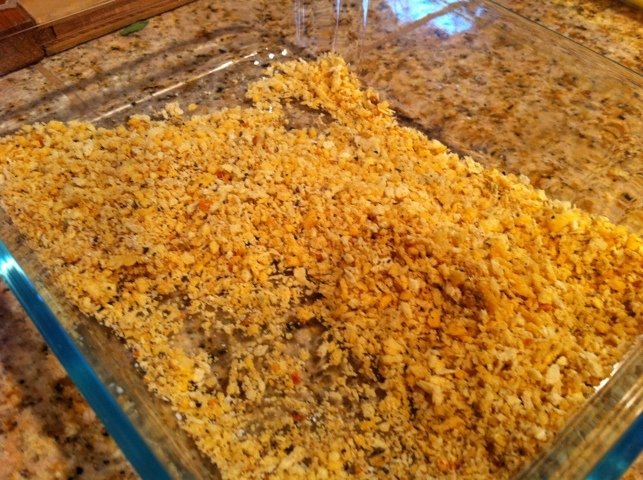 Put flour into one bowl, panko crumbs in another, and mix milk/egg substitute in another bowl/pyrex. 3. 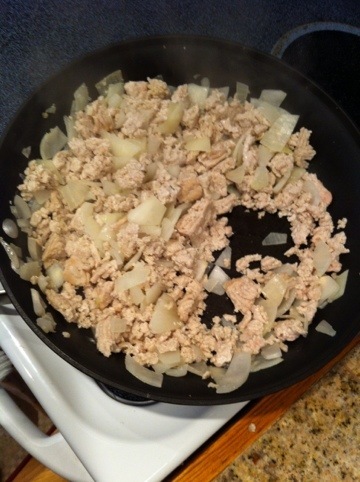 Dip the onion in the egg mix, then get it covered in whole wheat flour. 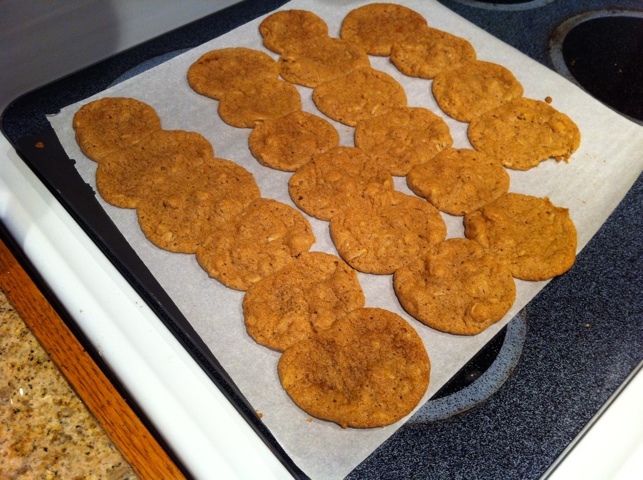 You MUST use the whole wheat flour for this not to be an epic fail. I didn’t on the first batch and the crumbs wouldn’t stick and it was a hot mess. 4. Take your flour-covered onion, dip it back in the egg mix, then dip it into the panko crumbs and cover the flower in tastiness. It will totally stick and create a “batter” at this point. 5. Put them in the oven for 10 minutes, taking them out to flip them over once, then cook them for another 10 minutes. They will be nice and crispy and flavorful, with way less calories than if you had them fried! I looked over the poll results from my last post and am definitely taking everything in to consideration. I was surprised at how many people wanted to hear about healthy recipes, so I will post them whenever I’ve made something new for you to check out! 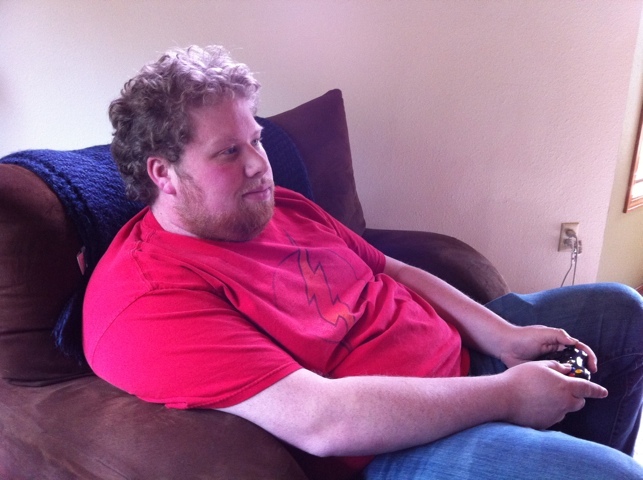 Definitely expect to see more of those around here, but still mixed in with other posts about weight loss, healthier lifestyle, and photos from some of my weekends. I’ll be working on a weekend review post in a bit (more likely posted tomorrow morning), but here’s a great recipe I literally just made. This weekend I went cooking-crazy! I was determined to have some healthy but really tasty food. We ended up making diet soda chocolate peanut butter cake, honey-mustard boneless pork chops, homemade onion rings, and then today I made us turkey chowder in our slow cooker. Yeah, you could say I spent a good amount of my weekend cooking, but oh man was it worth it. Chopping up the ingredients is pretty much the most difficult part of this whole thing. It takes you a little bit but really isn’t that bad. But then it makes a pretty pile of ingredients! I put the condensed soup and broth in the slow cooker first, but it doesn’t really matter how you put it in or in what order. It looks pretty gross at first. 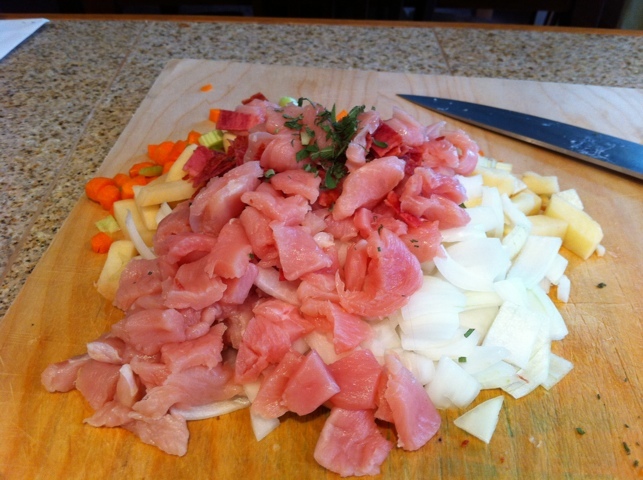 Dump in the rest of the ingredients from your cutting board, then give it a good stir to make it not look so gross. 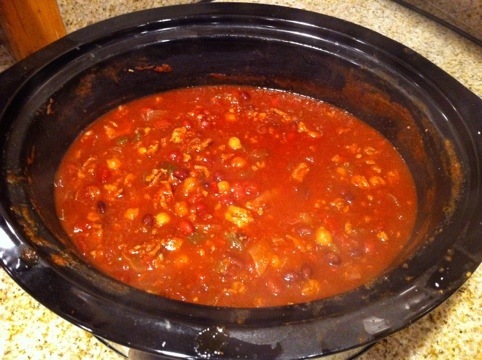 Put on the cover, set your slow cooker to low, and then just… wait for 8-10 hours on low (or 4-5 on high). Oh! I was worried at first that I was supposed to have cooked the turkey prior to putting it in the soup, but no, it totally got cooked over the 8 hours. You CAN cook the turkey beforehand if you’d like, but it’s not really necessary. 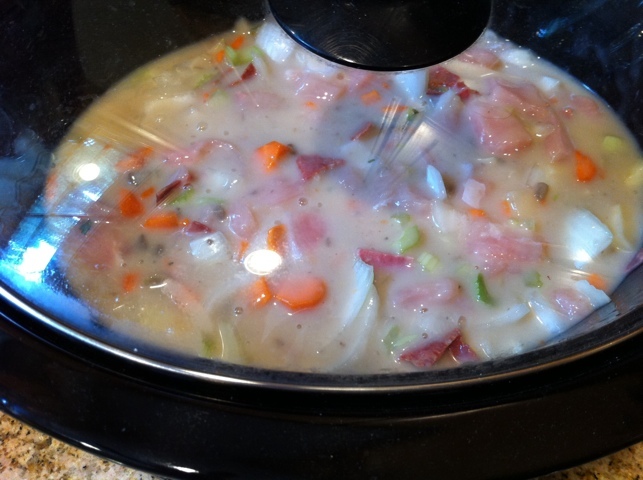 Go play or something for awhile, then come back, turn off your slow cooker (if the veggies and chicken are tender), and take the pot out, letting the soup cool off a bit. 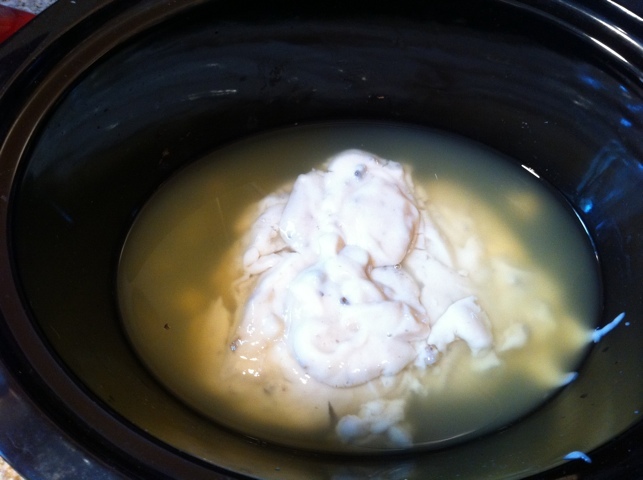 It will look a bit watery/not chowder-y, but if you let it sit for around 15-20 minutes, it definitely thickens up. It’s not the prettiest thing you’ll ever make, but it’s really really tasty! 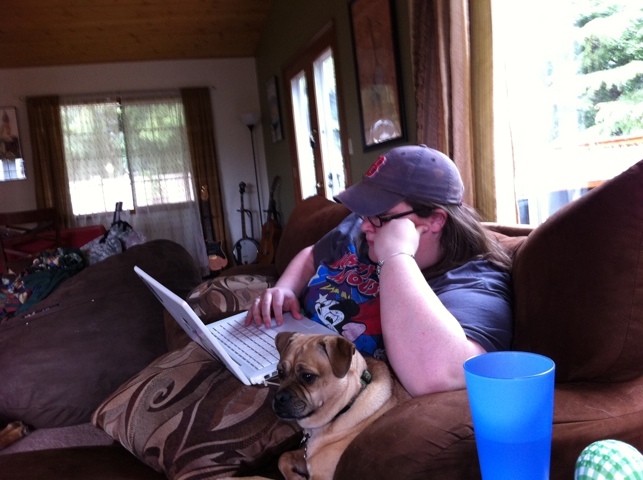 There are, however, a few things I would change for next time. 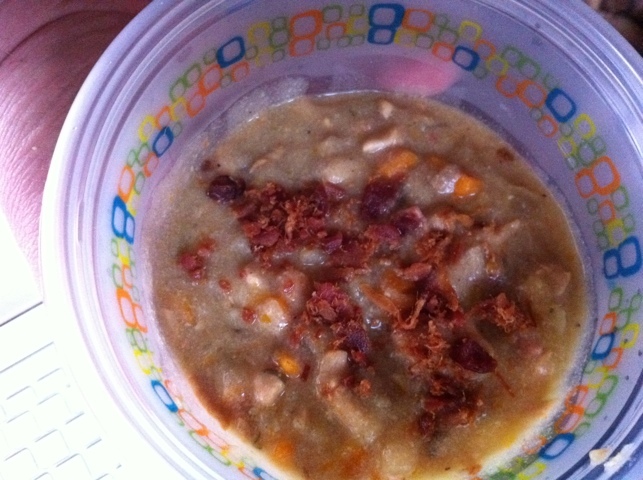 I would wait to put the turkey bacon in after as a lot of its taste got taken away by the soup. It’d be a great way to make it a little less bland. I would also probably add some other spices, like maybe some red pepper for a little kick or smoked paprika. The potatoes took over the soup a little bit, but I’m not complaining about that. Outside of that though, it honestly was really good and extremely filling and I highly suggest it as a quick and easy meal that will make your home smell amazing, is filling, and isn’t crazy high-calorie. Oh speaking of which, one serving (which is 1 Cup), yields 161 calories, 4g Total Fat, 2g Sat Fat, 0g Trans Fat, 46mg Chol, 14g carb, 2g Fiber, and 17g of Protein. 2 servings for dinner is MORE than enough, and only puts you at 320 calories for a hearty meal. We ate it for dinner tonight and now have plenty of leftovers for lunch (only for me since Matt’s in NYC for the week, wompwomp). 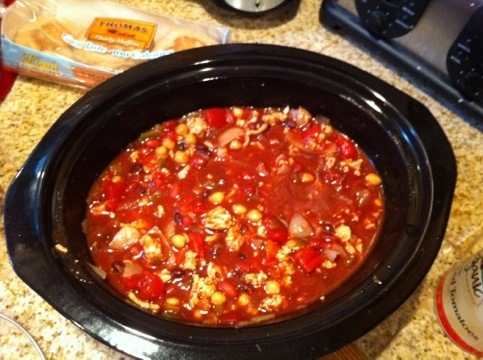 If you decide to make this soup, let me know what you think and if you decided to tweak anything. I’m interested to see what people come up with!